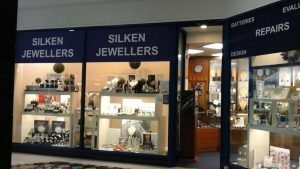 SILKEN JEWELLERS stocks giftware for all occasions, a wide range of watches, sterling silver jewellery, as well as 9ct gold and designer costume jewellery. We strive to provide customers with beautiful items at competitive prices, alongside a really enjoyable and friendly shopping experience. Services include jewellery and watch repairsand quotations for jewellery insurance. Watch batteries and straps supplied and fitted in store.